Aaron Farmer, AIA is a self-proclaimed lifelong student. 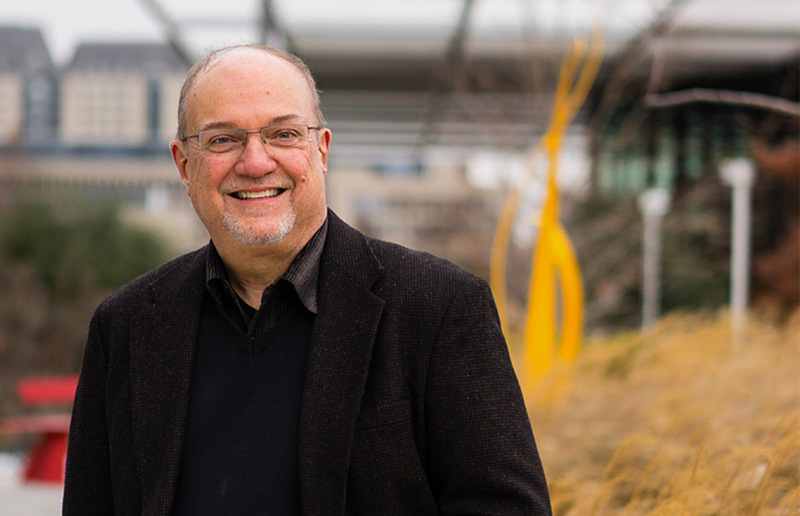 With 35 years practicing alongside the late Bill Booziotis, he has played a role in many award-winning projects in Dallas. These include Booker T. Washington High School for the Performing and Visual Arts and the Dallas Public Library master plan and facilities assessment. A firm believer in the idea of “In building, do no harm,” Farmer suggests that the design community has a moral obligation as shapers of the built environment to educate our clients, community, and building users about the role architecture can play in enhancing the human experience. He believes this can be accomplished morally and ethically while creating value, increasing well-being, improving interaction, and embracing social responsibility. After closing the doors at Booziotis and Company in 2016, Farmer embarked on a new journey, bringing his expertise to OMNIPLAN while also pursuing a Master of Arts in Theology, a degree he sees as complimentary to his role as an architect in Dallas. Recently, we sat down together in his new office to discuss his story. You worked with Bill Booziotis, FAIA for many years until his passing in 2016. How did you come to meet Bill? I had met Bill through his involvement in the AIA. He also taught a course at the University of Texas at Arlington on event planning when I was president of the UTA chapter of the American Institute of Architecture Students. There, I met Bill and was exposed to his marvelous creative nature. We got to know each other well and enjoyed each other’s company. He ultimately ended up calling me one day and asking if I would like to come visit with them. I agreed, and went over to his office. It wasn’t a formal interview at all, and I didn’t even bring a portfolio. We just talked, hung out, and enjoyed having lunch. Long story short, I was offered a position at the firm and became the seventh employee at Booziotis and Company at the time. Bill, of course, was known as a design leader and it was just the right place to grow as a young architect and be around some of the most creative people in Dallas at the time. I knew that I had landed in the right place. Bill was always more comfortable with a smaller office workforce because, for him, it was about engagement. Part of what we promised our clients was personal engagement from the firm’s leadership and he wanted to be able to do that. Obviously as the firm grew certain people grew in to leadership roles, and in 1989 the old practice evolved and became Booziotis and Company and I became one of the principals that year. At our largest point, we had grown to 32 employees. He would emphasize the need to rethink everything around the view and think about where the art is being placed; he was always very interested in every aspect of a building and the spaces inside. You could not satisfy the firm’s expectations and values by thinking only about one thing or even a few things. You had to constantly be thinking about all aspects and holistically about the human experience. What types of projects were you most heavily involved with while with his firm? Booziotis and Company was sort of two practices with two types of client bases. Part of the firm was engaged in our well-known residential practice and the other part was involved in our civic architecture and public work. That is where my passion lies and it was my primary focus while with the firm. Therefore, most of my time as an architect there involved working in certain genres of projects like performing arts buildings, arts and cultural buildings, places of worship, libraries, and educational and community-based projects. You recently embarked on a new journey academically as you continue your professional career as an architect. Tell us a bit about the Master of Arts in Theology you are pursuing. My current focus is on the ancient near-eastern studies from around 3500 B.C. up until 1 A.D. and largely focuses on studying the framework of the cultures and context of the Bible during this time. This is also when the Judeo-Christian religious element developed, and I am fascinated by how the culture, social values, political values, and literary style are reflected in the writings of the Bible during this time. The religious text and the faith of the people reflected their culture by indicating how they lived, the places they lived, and how the architecture was integrated into their built environment. What are the parallels between these ancient societies and our modern-day society? What are some of the unique challenges we face today? That period of history was heavily impacted by the architecture of its society. If you look at city-states like Babylon during that time, those cities embodied and conveyed their culture through integrated art, architecture, and the public spaces that were created. These were places where communal activities took place and they were the embodiment of the community. We might not always see our context in the same way that they did. Our challenge as an automobile-based society is that we don’t necessarily feel that same connection to the sense of communal space. We tend to be scattered throughout the city and often our roadways can isolate parts of the city from others and eliminates the combined notion of community. As an architect, consider the differences of designing a retail center versus a library. One’s primary objective is for business and profit making while the other might serve an entirely different purpose. However, these are all places where people come together and there should be a communal process of getting there. Every aspect of that hinges on community values. How we build our buildings and our roadways can eliminate general isolation if we think about the sense of shared space and how our architecture can shape and create value for community. Is there a moral connection between pursuit of your degree and your work as an architect? My decision to pursue studies in theology has always been a personal interest. I am active in my church and in my community, but those aspects of my personal life had not meshed with my professional life as an architect until I began drawing the connections. The built environment impacts everyone in our culture. It is an element of healing, growth, and accommodation. It can lift people up and make them feel a certain way whether it be good or bad, but it never has a neutral effect. When you consider these elements of the built environment and the parallels to my theological background, which in many ways can also provide aspects of healing and growth, there are many similarities. I want to be an advocate for being intentional and to be very critical about what it is we build and how we build it. We should extend this notion to the client community, whether it be theological, institutional, commercial, or even educational. The built environment is a “tool” for community and should be viewed that way because our response should not be neutral. It needs to create community value and a sense of shared space or communal space. How do you define communal space? How is it defined in the theological sense? In theology, there is this notion of “sacred space” and we all think we know what that means as architects. However, I think sacred space has evolved in terms of its true meaning and what it means to the larger culture of society. At one point in time, “sacred space” was that place where you went to meet with God or your religious community. It was a communal space such as the church, the temple, or even the church yard. While those spaces exist as sacred spaces even to this day, those are not the only kind of spaces that can be sacred. The modern understanding of Christian theology takes the notion that God does not only dwell in one building or area, but that He is omnipresent. Therefore, the healing and the restoration which is the primary theme of the biblical text occurs in the larger space that God inhabits. This could be the community market center, the event space, that human space where we go to do business, or to dine and eat. It could also be the parks or places of recreation that are all spaces God inhabits. So essentially they are all sacred. As shapers of the built environment, if we begin to treat space in the way our theology would guide us—and that is to think of them as healing spaces and uplifting spaces for everybody—then that is going to change the way in which you build and how you craft. No matter what your purpose is for building, “In building, do no harm.” Do not undo a community or design something that is incompatible only because the land is available and it is cheap. We have to think about other potential users and consider the broader community. As architects, designers, and planners, think about using some element of your development and resource to rebuild that community that might be on the verge of becoming broken or is in need. Those are all things that we can do and we can do them together to transform our community such that the whole of the city is sacred space and is not only specific to its theological reference. Are there common values or themes associated with designing these types of spaces? Gathering, celebrating, dining, theatre and performance, these are all common experiences for all people. It doesn’t matter who you are these are elements that we all participate in and are the kind of environments that inspire and create common values for virtually anybody. Therefore, I think you have to ask yourself two questions: One, what causes people to come together? Two, what causes them to enjoy that experience of being together? Is it nature or being outdoors? Or perhaps the ability to interact with a few people while still being amongst the presence of a larger crowd that is also enjoying the same thing or experience. One of the most exciting things for me working downtown is having Klyde Warren Park at our front doorstep in this neighborhood. It is such an energizing place to come together and it attracts everybody! It does not single out a single user group, or age group, or gender. Everyone is down there having a great time! You rub shoulders with everyone and it is not a place that you experience in isolation. I think that is what makes spaces successful. Providing fresh air and daylight can create comfort, healing, and enjoyment. These are universal experiences that are not just beneficial to one user group. We live in a community and we do in fact need to rub shoulders with each other and enjoy that process. When building and designing, one should be cognizant of where you fit into the larger scale and context of the city. There will always be spaces that are meant for the sole purpose of certain users but we must not ignore the larger need when creating these places exclusively for one part of the community. How do you see your theological studies and interests meshing with your current role as an architect here in Dallas? I am hoping to complete the Master of Arts in Theology next year and shortly start my doctorate thereafter in leadership. I want to be able to study the process of taking these ideas through learning how to be an effective leader and carrying that into the community in a way that makes a difference. I don’t ever want to reach the point where I stop learning. But I also want to give back and share some of what I have learned along the way. It is not a parallel approach to learning because what I learn is integrated and woven into my practice as an architect and my hope is to give back and share some of the insight I have gained along this journey. I want to take my experience working at a very small and personal scale with Booziotis and Company and now engage a larger level of practice here at OMNIPLAN in areas like urban planning, city planning, and large-scale developments. This is an office that is heavily involved in the urban built environment and it is an area I have become very focused on. I am interested in the idea of doing the right thing as an architect and I don’t think it starts or stops at any given scale of what we do. Creating community value means doing the right thing at the city planning level, the urban and regional level, and doing the right thing for our buildings. We live in a defined place that has a defined climate and we have a shared responsibility to look out for our ecology. There are ways to respond to all the levels of information in an integrated and critical manner that improves and does no harm. I am not a physician. I did not take the Hippocratic oath, but as an architect, we should have the equivalent. How different architecture might be if we had all sworn an oath to do no harm? In your studies are there ideas that you hope to expand upon in your professional work? As one who is going for a Master of Arts in Theology (MAT), you write a lot of papers. I try to craft many of the papers I write around the particular course subject and seek to explore how the material relates to architecture. There was a paper I wrote recently for a course in human development in which I referenced the popular culture literature series of Harry Potter. Now, if you are familiar with the series then you will recall the Hogwarts Castle, which is the fictional school of magic for students. Inside, there is a central stair called the Grand Staircase that transforms itself to meet the needs of the user climbing the stair. As you climb, the stair morphs and the building essentially changes to respond to the thoughts and needs of those climbing up the stair. Even the stair landing may vary so that the floor you exit on might be different, depending on the person using the stair and what his or her immediate needs are! The proposition of the paper is that Hogwarts is a cinematic ideal architecture. Now the obvious reality of this in architecture is hard to achieve, but cinematically it is quite beautiful. So what does one do if you cannot create architecture that can recraft itself to the user? Do we create architecture that makes the users recraft themselves to the building or allows control over some aspect of the space? Or, do we build architecture that inspires us to be who we are and more? That’s really what the Hogwarts stair is doing. It’s engaging and inspiring people in some way in a dialogue to become more of who they were when they began the ascent up the stair. This is one of my favorite ideas in architecture and it’s based on concepts of human development theory that states that we learn through interaction and we take cues from our culture or from the architecture of the culture. Architecture should speak to its user and certain human development theories essentially embrace this concept by agreeing that architecture can speak and teach its users. I think the question we should ask ourselves to do moral architecture is “How does our architecture teach the user and what exactly is it teaching?” What is it saying to the new initiand to the building, the child, the elderly, or the alien who is experiencing our culture for the first time? What is it teaching me to become? It’s the Hogwarts idea. Are there biblical themes associated with the City? As an architect, how would you define your role in the context of the City? If you read the Bible from the beginning book of Genesis to the end book of Revelation, you know it reads as a story. And in the beginning of the story, God is reacting with people in a garden. But when you get all the way to the end of the story in the book of Revelation, it talks about the new City. The ultimate end of the redemptive work that the story talks about is in the City. Its focus is on the City. It is about sharing the City, and it’s a City that welcomes everybody. I think that is a very challenging and thought-provoking notion to an architect. To read that story and realize that if I am to be true to that story as an architect, I must understand that the place where the quality of life comes together in that story is the City. It is a theological city, but it is still a City. There are a broad range of issues that make up who we are as a regional people and our architecture should respond to the climate, the resources, and the things that identify us as a community, whatever that may be. These elements express unique architecture and helps people enjoy the way they live. I grew up in a small town of Telephone, TX, out on a farm. One of my favorite aspects of being on a farm, is that you are in touch with nature. There was no air conditioning, but the architecture of that farmhouse responded to its place, and it was pleasant and cooling. It responded to the heat and it was inviting. Sometimes I think we start to lose track of the things that make us comfortable. We have ideas and as we develop these ideas they become wonderful objects, but they are not necessarily cool or inviting areas on a hot Texas day. We have to think about the things we are being pressed to do and consider strategies like energy conservation, like elements of shade that respond to the climate we live in. Interview by Ezra Loh, Assoc. AIA, with Corgan. Born in Dallas, but my hometown is Telephone, TX. In college, I minored in music; I used to be a choir director. Spanish architect Antoni Gaudi (1852-1926) and secondly probably Alvar Aalto. Locally, O’Neil Ford, FAIA. I frequently visit Rex’s Seafood, but for special occasions I like Old Warsaw. Living near White Rock Lake is absolutely fabulous. My travel goal is to visit all continents. My dream vacation would be a food and culture experience around the world, repeating as necessary to avoid ending. Past or present, who would you like to have dinner with? I love British theater and TV, so I would like to have a dinner party with Dame Judi Dench and Dame Maggie Smith. I would also invite Julia Child because of my interest in food and wine.